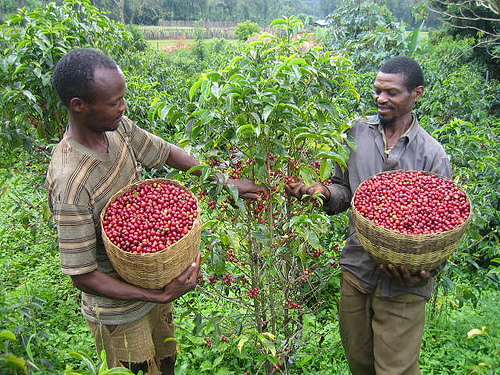 Two Farmers in Ethiopia Pick Coffee Cherries, the fruit processed into coffee beans (Image courtesy The Upcoming). 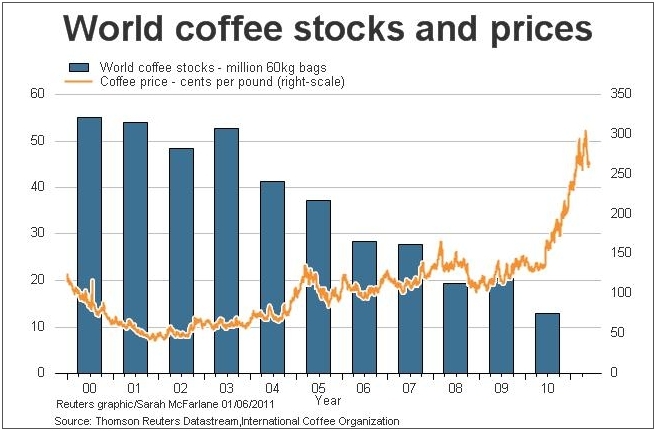 Ethiopia’s success has been driven, at least in part, by a price increase for coffee between 2003 and 2010 (see graph above). This price increase generated additional employment and income at the household level and higher tax and excise revenues at the national level. But since 2010, global coffee production has grown sharply and prices are starting to decline. And with lower coffee prices, Ethiopia’s development strategy might falter as well. For now, though, Ethiopia is rightly basking in the limelight, having shed its image as a land of famine and hunger. What do you think? Does Ethiopia’s success in reducing child mortality rates suggest a path for other developing countries? Or is Ethiopia’s dependence on coffee exports too risky a model? Take the poll or leave a comment below and let us know what you think. (An earlier version of this story was originally blogged as “The Role and Risk of Coffee-Based Development in Ethiopia” at Global Food Politics. This version is reprinted here by permission). When Amartya Sen published his groundbreaking book, Hunger and Public Action, he challenged the prevailing wisdom about the reasons for hunger. Conventional wisdom (which continues to dominate discussions of hunger even today) was that the primary cause of hunger in the global south was overpopulation. The theory, dating back to Thomas Malthus’ analysis in the early 1800s, rested on the assumption that population growth would necessarily outstrip the ability of humanity to increase food production, leading to widespread hunger. In the nearly two hundred years since Malthus’ published his argument, there has been widespread hunger, massive famine, and other calamities. But Malthus’ argument remains problematic. In the vast majority of cases, food remains available during famines. In general, the problem has not been one of underproduction—of a lack of food availability—but of access to the food produced. Even during the worst of famines, food remains available for those who can pay for it. Sen’s work highlights this apparent paradox in through his use of the concept of “entitlement,” which he defines as “the set of alternative commodity bundles that a person can command in a society using the totality of rights and opportunities that he or she faces.” In the context of famine and hunger, then, what is important is not the amount of food produced, but the ability of individuals to secure access to the food that is available. (Georgois Altintzis offers a critical engagement with Sen’s argument, highlighting some of the challenges it has faced since the early 1980s but concluding that it continues to offer a good explanation of food crises sparked by trade shocks, wars, crop failure, erratic weather, and sanctions). Reject the conventional wisdom of free market economics, instead asserting a central for the state in agriculture, in particular by supporting small farmers (through access to credit, research and extension services, technology, income or price supports, etc. Balance policy support between commercial agriculture for export and production of food for domestic production. Encourage a more equitable distribution of land by engaging in land reform efforts. Establish basic social protection measures. In short, the most successful countries appear to establish policies that encourage domestic production by small farmers while simultaneously attempting to guarantee food entitelements.